Happy 2017! It's been quite a while since our last update, so here’s the latest from Kati and I. We bought a house in February! We walked in and loved it and the real estate agent told us we had 8 minutes to make an offer (there was already another offer pending). So we did a quick survey of our other impulsive decisions (get married, start Kindara) and decided to pull the trigger. The former owner was a lovely old woman, born in Germany during World War II. She was a painter and photographer, and we connected with her. She liked us too, and although tragically she passed away 3 days later, the last thing she said to us was “This was a happy house, keep it happy”. So we call our house “Happy House” in her honor. In March Kati finally got her driver’s license: A great accomplishment! I bought her lessons for her birthday in 2015 and they paid off. In April I became an American citizen! The ceremony was beautiful and Kati and I both shed happy tears. :) Now I hold dual citizenship with Canada and the US. I got a signed letter from Obama and wore a tie of my granddads, who always loved the US of A. In June we went to Apogaea, Colorado’s regional Burning Man event. We organized a small camp of about 25 of our friends, and had a lovely and hilarious time in the mountains of southern Colorado. In July we decided to do a camping trip, just the two of us. 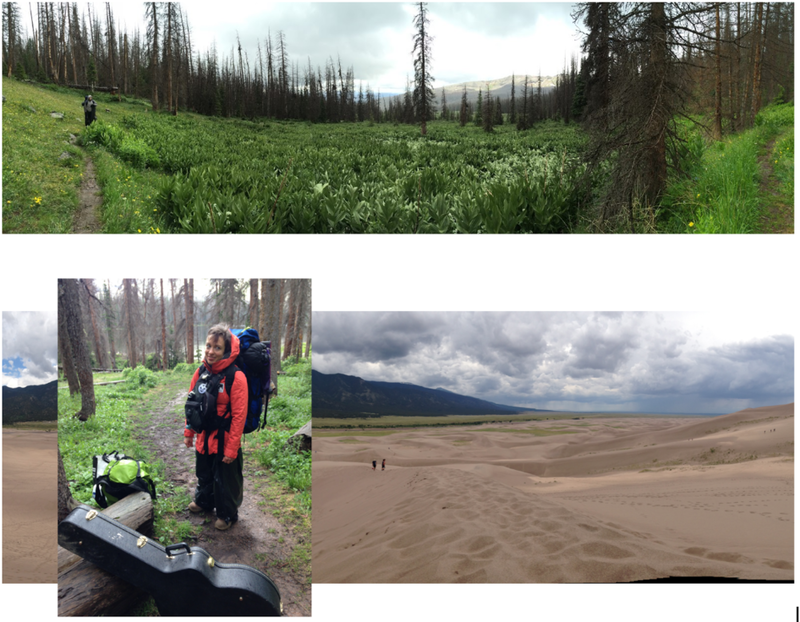 We started out at the Great Sand Dunes National Park, enjoying beauty and recreation in the dunes for a night before heading off to a National Forest. Unfortunately the weather was uncooperative and we spent a single freezing freezing cold night there, trying to stay dry in the rain. We called off our camping trip, packed up and went home where we spent the rest of our 4th of July weekend introducing Kati to entire (original, original cut) Star Wars trilogy. She is now one with the force. August brought Kati's birthday, and my mission to teach her how to drive stick shift, so I wouldn't have to drive the 20 hours to Burning Man by myself. In Kati's words "Will is a good teacher and exercised unending patience as I crept up and down the streets of our neighborhood at 15 miles per hour (and only once broke down crying in a cul-de-sac 100m from our front door -Embarrassing!)". Terrified? Not at all. Kati learned quickly, and did her share of the long drive to and from Nevada in September. Kati and I at our annual pilgrimage to Burning Man. We noticed many more foreigners this year. Burning Man is going global. Will and I at our annual pilgrimage to Burning Man. We noticed many more foreigners this year. Burning Man is going global. In September we took a detour on the way back from Burning Man, and stopped at Meow Wolf, in Santa Fe, New Mexico. Meow Wolf is a 20,000 sq/ft interactive art installation/puzzle, in an erstwhile bowling alley in Santa Fe. Anyone who is interested in art, this is THE go-to art experience destination. 10/10! A must see! Creatively, Kati has been working on CordSnaps, making art, and doing freelance graphic and UX design for companies all over the country. If you or anyone you know needs design work, let Kati know. She offers a free consultation and is excellent at what she does. I've now transitioned away from running Kindara full-time to sitting on the board. This fall I built a music studio in the house to have a space for my music making adventures without interruption, and I'm currently on walkabout in Bali until April, taking some time to relax after 7 long years at the Kindara helm. A Christmas sunset and our first ever Christmas tree at Happy House.